CMI launched dBrochure, our digital brochure, a little over a year ago and our clients have experienced tremendous results. If you’re wondering how you too can improve your bottom line using a digital brochure we’ve created a list of the top 5 ways a digital brochure provides benefit. The dBrochure is an incredibly effective way to communicate with prospects. In today’s day of never-ending social media feeds, your prospects are bombarded with competing messages. With a dBrochure, they will receive the benefit of a tactile, print piece which opens to your video delivered without distraction. Our client, a major cable provider, has seen sales grow after leaving the dBrochure in the lobbies of prospective apartments. It is an unforgettable leave-behind. When you need to train staff for a restaurant, coffee shop or even to share important safety instructions, a dBrochure can convey up to 30 minutes of training information. Your video also has a full array of features including play, rewind and fast forward so viewers can learn at their own pace. Do you have a product that requires installation instructions? Or maybe where there are numerous frequently asked questions? Our clients solved that problem by using a dBrochure with all of the instructions on video which can be paused, rewound or fast forwarded as needed. By having the answers at their fingertips, customers will not need to call for assistance nearly as much. Our clients have grown their brands by using the dBrochure in direct mail campaigns, sales calls and as leave-behinds. 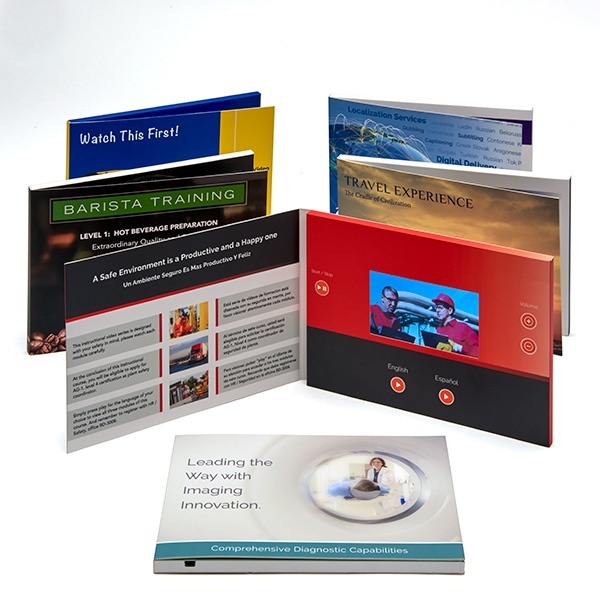 The dBrochure can be customized with your branding and video and comes in several sizes. In a pile full of generic brochures and mailers, the dBrochure stands out and gets your message across. CMI has been localizing content for over 50 years for the major Hollywood movie studios. If you need to deliver your message globally – whether it is for sales, client service or brand awareness, CMI can provide the subtitles and dubbing in over 150 languages right onto your dBrochure video. Click here to learn more about dBrochure by CMI. Subscribe to the CMI Blog!